Here I am, back to Goosebumps but a little bit different. This time I am covering some Goosebumps comics. 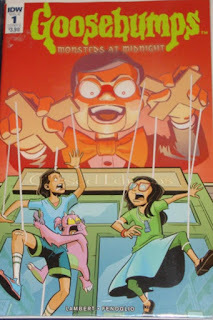 Now some time ago I reviewed Goosebumps Graphix #1 which was a collection of 3 adaptations of Goosebumps novels into comic form. What I'm talking about now is a little different. 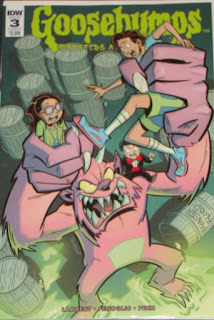 Goosebumps comics published by IDW Comics are instead original stories inspired by the classic books. So far they have published 2 stories which are comprised of 3 comics a piece. 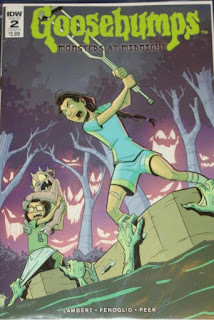 If you don't want to track down back issues the first story, Monsters at Midnight which I am gonna talk about a little here has been collected into a hardcover collecting the 3 comics. I am not going to write up a complete synopsis of the story like I do for my regular reviews. Those reviews are for books 20 years old I want to relive. This is a modern book, out this year, and I think you should all go out and buy it to experience it for yourself. Of course... I should tell you a little about it. So Mia and Ginny are spending their summer vacation with grandma and things aren't quite going as thrillingly as planned. When Ginny spots a creepy book store and wants to find a copy of a book that should be quite familiar to Goosebumps fans, the girls sneak out at midnight to find it but get more than they bargained for! I will say they wind up ultimately in a place which faithful readers should be quite familiar with, and some characters that they should be familiar with to. This isn't just a rehash though. The story is all new, and they find some new characters along the way quite important to the plot. Ultimately it is a nice mishmash of things old and familiar with some newness mixed in. I think this book would be great both as a way to introduce kids to Goosebumps or to excite someone who is already really familiar with the brand. If they have read a bunch of Goosebumps they'll see a lot of references they know and love. But it isn't just a "remember this!?" book. 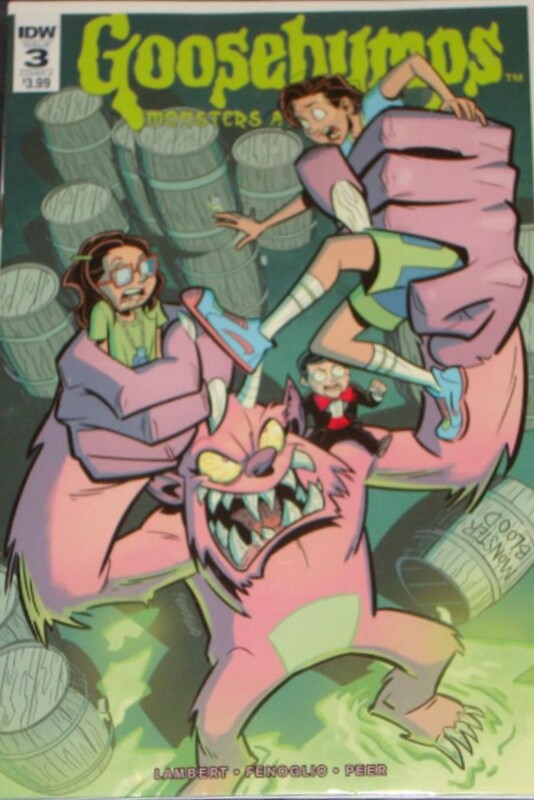 Example, at one point the girls get served a nice big bottle of Monster Blood. If you're familiar with that book you'll get a smile of seeing the ooze appearing. If you aren't familiar it'll still be a gross bottle of slime, and maybe if you get into the series later on you'll be familiar and then love the reference when you figure it out. The plot is fairly solid for a comic book. It manages to both feel like a Goosebumps yet not feel entirely shackled down by the format. It has some trademarks the series is known for. Comic book versions of jumpscares for example. But also the plot doesn't really play out in a way I think a Goosebumps book traditionally would... and I think that's fine! After how many hundreds of Goosebumps books there are it's ok for there to be a little difference in the series. It is not different enough to feel "not Goosebumps" but different enough to feel... different. Of course for a comic one must talk about the art. The art is really good and fitting in my opinion. It is bright, fun and cartoony with just and edge of scare. I admit a few panels are actually kinda freaky to an extent. A lot of it is in the eyes. Scary eyes! Ultimately I'd recommend Monsters at Midnight. If you have a comic book shop you could check for back issues, or you can just see if your local book store carries the hardcover collection. All else fails, you can always get it online. As I mentioned there are 2 series so far. The second is called Download and Die which I may cover at some point, but regardless should mention and recommend. It has many of the same strengths as the first one, while providing new characters and story. Currently Download and Die is only available in the individual 3 comic books but I imagine soon it should be out as a hardcover collection as well. So thanks for reading, I'll be back with one of my more traditional reviews next time. I just really enjoyed these comics and thought I'd write up something to let you all know I give them the thumbs up. So until next time... stay spooky.